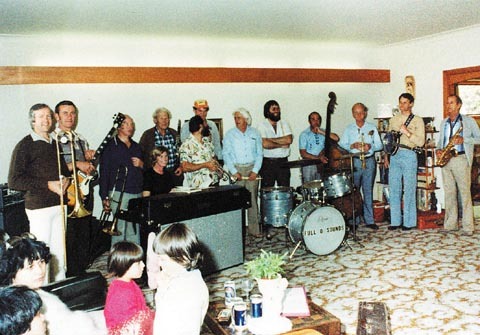 The Gipps Dance Band were in town and were relaxing on the Sunday after playing for a Ball the previous night and Stan had invited the fledgling Down South Jazz Band to attend a casual blow that day back in 1980. 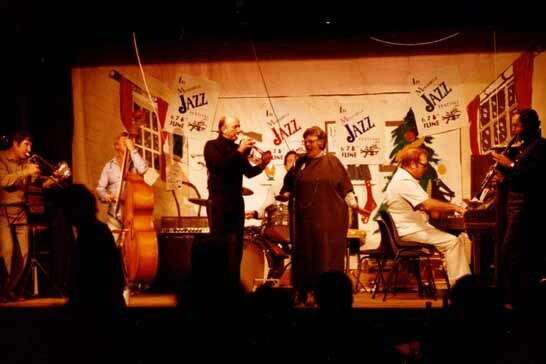 Local musos Barry Pascoe John Cursley, and John Moffatt along with Stan agreed that the idea was worth following up and those four became the organising Committee for the first Merimbula Jazz Festival held in June 1981. 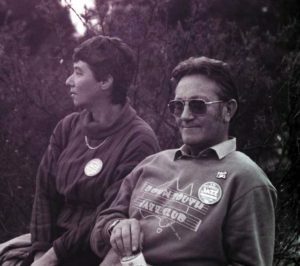 Barry Pascoe is recognised as the founding father and was the driving force. He had played trombone in the Abbey Jazz Band and had been on the Australian jazz scene for many years before settling at Bega where he was the Hospital’s Medical Superintendent. It was Barry who insisted that the effort be made and urged the others to go along a path that put the first Festival in place on the 5th 6th 7th and 8th of June 1981. Sadly Barry passed away in 2001. He had attended regularly in the recent years and played trombone again after an illness. 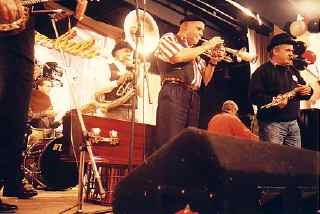 The Down South Jazz Band led by Jiri Kripac had formed (a theme ready for another historical musing,) and was practising together regularly at the Wolumla Pub. The band registered for and attended the 35th Australian Jazz Convention (the first Forbes) in December 1980. They were very well received at the band’s first outing at a Convention.The members were Jiri Kripac tpt., Monique Lysiak clt., Barry Pascoe tmb. and voc., Gordon Brown pno., John Cursley dms., John Moffatt sou., Bill Maclean bjo. Their roadie (and navigator for the flight over in Moff’s Chereokee) was Walter Brunton. Barry, John Cursley and the others spread the word to Convention Musos and Delegates and issued the very first MJF newsletter with rego forms. 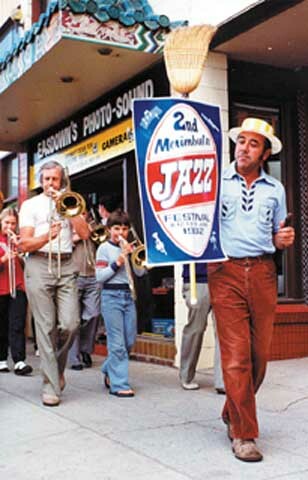 They publicised the fact that a founding jazz festival was to be held at Merimbula on the following June Long weekend of 1981. Not many people in the Jazz world at that time knew where Merimbula was, but that has since changed! This has varied, only slightly, over the years and it continues to be a comfortable length festival. Welcome night for musicians features the provision of food and drinks on Friday night for the registered musos. In the beginning John Moffatt served his popular hot soup from the Twyford hall kitchen. Of course, many jazz visitors to the town arrive earlier now and stay on for some time after the festival to extend and enjoy what many treat as a holiday break. All the preparation for the first was completed and an anxious Committee waited and wondered in Twyford Hall on that first cold winter’s welcome night, but would any musicians, or for that matter, anyone at all, turn up? Well, it is now a matter of history that they did and that set the pace for all later festivals. The program had Welcome Night Friday 5th June 1981 kicked off at 7.00pm in Twyford Hall with half hour blackboard sessions. Saturday saw a parade at 11.00 from the old RSL down the rear of Twyford hall. Saturday commenced at 12.00 noon with a break for lunch and dinner.The picnic was for informal blowing at Stan,s South Haven Caravan Park. 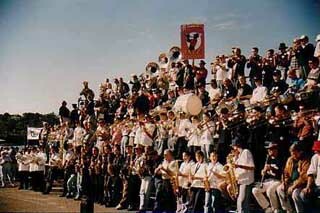 The early formative events saw about 20 to 30 bands register. Bands such as Down South JB, The Gipps JB, Central JB, Des Camm JB, Jerrabomberra JB, Max Causon’s BB, Paul Furniss San Francisco JB, John Judge’s Myldewed Figge, Bill Haeslers Washboard Band, Dr Jazz Mark Whitty and sons, Keith Sadler’s Gold Tones, Riveria J B, Pierre’s Kammacher and others. Musicians arrived in town on Friday afternoon, quickly settled into their digs and rushed down to Twyford Hall where they were greeted by the Committee and especially by the hard working Brenda Cursley and Jacqui Pascoe who attended the rego desk. They collected delegate registration and directed people to where other local helpers such as the Merimbula Apex Club workers manned the Bar. In the early years the official program commenced at mid-day Saturday. Programming then, was a breeze, Barry and John Cursley used to do it on a foolscap sheet in John’s Bega home lounge room just a few evenings before the Festival. Of course if any thing went wrong it was easy to correct: Just ask for sit ins.Everyone knew everyone else. What with one venue at Twyford Hall on Saturday and then one at the Eastern Jade Restaurant on Sunday all bands got two and sometimes three sets on stage. The festival continued to grow in size and popularity due in no small way to the reverse psychology used so well by John Cursley. When at the Australian Jazz convention each year and whenever in Sydney, Canberra or Melbourne at the popular jazz venues, as we often were, the word was spread to musos and listeners individually. “Make sure and come to Merimbula next June”, with the proviso “but don’t tell anyone else about it”. Well they did, and the Festival attendance kept rising. We have always had a wonderful bunch of jazz folks turn up in Town. There is always pressure to advertise the festival in wider and national media. This has always been avoided by the Committee. Word of mouth within the jazz scene has proved to be our best means to ensure continued smooth running and success from year to year. As band registrations grew each year reaching 60, more venues were necessary. Twyford ran by blackboard on Friday and programmed from 12 Noon Saturday then on Sunday, everything moved to the old RSL Club at the corner of Main and Market. Here we had the Auditorium for comfort and a dance floor together with the wonderful Scenic Lounge Bar. This area was not programmed for some years. It was just a great meeting place for all festival goers. The club Dining room was the venue for great jazz breakfasts along with a three piece band and the big fountain flowing chilled champagne. The Street Parade commenced in main Street near the Sports centre and proceeded down Market, left into Beach and ended in The Plaza café square. As Muso numbers grew each year other “All in blow” venues were tried. The back of a semi trailer at the 12th, then a band stage next to the lake for the 14th. The Monday jazz picnic was traditionally at Yellow Pinch Wildlife Park. It was during this period that I became a member of the Committee. John Cursley had left and Barry Pascoe moved to Sydney. Stan, John Moffatt and I continued with the traditions that had been so well established by the founders during the early years. Stan’s wife Helen and my Clare have also contributed in no small way to the festival success. Another controlling factor of the festival size was the steady increase in good holiday accommodation being developed in Merimbula each year. This was always kept full for the festival weekend and so allowed for increasing registration numbers. It would be hard to find a better time of year and location for a Jazz Festival. Twyford Hall continued to be the essence of the festival. It’s compact size, wooden floor, questionable toilets and Terry Hayes with a microphone all added to a unique experience for those Musos and Jazz lovers who have been there. An alternative Picnic venue was tried at Magic Mountain but a survey of Musicians that year elected to return to the Park for the next Jazz picnic. To the consternation of Moff and Stan, I missed the 10th by taking a trip to the States to attend the Sacramento Jazz Jubilee. This gave me some insight into the running of such a large complex event. I took the opportunity to chat to as many officials as I could to learn how they coped with the hugh number of badge holders (up to 100,000) and the bands along with the logistics of so many venues spread far and wide throughout the City. The Golden City Jazz Band from Ballarat was the Australian group invited to attend, Naturally that was our must see venue on the first day to cheer them on. More bands and more people meant more venues. The Lakeview Pub had always been a good watering hole for festival goers. It was well established as the impromptu Monday night wind down venue. Earlier Monday nights wind downs were held at The Eastern Jade restaurant with casual blowing and “sit in” sessions. Well it was time to try this out, Bazza’s as a programmed site. It’s success saw it continue as a very popular venue. 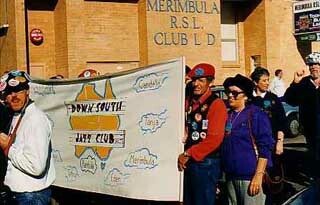 When the RSL Club moved from the old site on the corner of Market and Main to it’s new premises in Main Street, we no longer had the advantage of a Big Auditorium so the next year, 1997, a large marque was set up as a venue at the rear of the Lakeview Pub. This worked well as sound in a marque is always good although it was an expensive option. It may be recalled the year we had the vacant old RSL building to ourselves? The Jazz office was established at Reception and Chris Neilson, our cashier, had the big vault to herself, there was the Audi, the Scenic Lounge, The Dining room and the Lower Meeting room. The only mishap was the sewer choke in that room down stairs and the unfortunate, necessary, closing down of the venue. The following year the Basement of the new RSL in Main Street was established and still continues as a venue. The Street Parade was reversed for a trial of something different and the all in Blow moved to Hylands corner. Not one of our most popular moves! So it was back to the big job for The Robin Hood Club boys of setting up a stage at the Lakeside by the Tourist Information Centre. Then for a few years Twyford hall was run on Sundays to provide more slots for the ever increasing number of registering jazz bands. When the heat went out of it’s annual Bowls carnival, the Merimbula Imlay Bowling Club came to the party with the Sapphire Room. This is a popular venue and comfortable. Extensions at that Club have given us the Bowlo Basement, a very jazz like room. In addition, with the grace of the Club, we now program the Main Bar on Sunday nights at the Bowling Club. In more recent years the Monday has been programmed for a few hours to ensure continuity of jazz for the locals and jazz devotees who flock to the Jazz picnic. This has changed the character of the event. Some say to it’s detriment for the festival musos. In the past the Jazz Picnic allowed musos to relax, meet, have a few ales and blow with others who they may have not seen over the weekend because of the size and pace of the Festival. John Moffatt retired from the Committee in early 1997 after 16 years constant work for the festival. Terry Leonard who was then the president of the Down South Jazz Club became a committee member at the 17th. He has a brain like a steel trap and can recall the names and instruments of most of the 600 musos now attending along with the bands in which they are to perform. Terry’s introduction to Jazz in this area began at the Town Hall Café in Candelo where late one afternoon in 1984, he and his family went in for a cup of tea and were enjoying the music from the sound system. “Enjoy the tea and cakes? Yes, thank you for staying open for us. Like jazz music do you? Yes! Well why don’t you go the next Merimbula Jazz Festival-great weekend?” Of course, it was later on that he realised that Terry Hayes and Carol were his hosts. Terry Hayes has been to all Merimbula Festivals and has been the stage manager at Twyford Hall and other venues all that time. He has set the standard for punctuality of bands and running the Program to time without favour. Terry retired from Twyford Hall doing his last job there in 2005. Lylie Price was inducted to the committee in 1999 for her skill as a secretary and to contribute a woman’s touch. You may notice the colours and decorations have blossomed since then. My office could no longer cope with the workload as the centre of pre-festival operations so a computer was found for Lylie and the registration processes for 1999 and later festivals, have been undertaken by her, with great skill. Her Public Relations are also a dream. Rob Young the most recent member joined the Committee in 2003 commencing with work in the Jazz Office. He copes with and increasing number of tasks and never shirks any job. Terry, Lylie and Rob are wonderful members of the Committee. Stan has been a stalwart who was a Founding Father and has been the longest serving committee member (25 years this year). He and Helen have always been there for the Festival child and have put in untold time and energy to bring the event up and make it what it is today. The turn of the Century has seen magnificent Festival events. Everyone keeps saying at each one that it was the best yet. Recent festivals have reached a high demand level of programming with band numbers increasing to 135 at the 24th and 168 for the 25th. The festival Colours and Venue decoration has flourished under the watch-full eye of Lylie Price. The Robin Hood Club do a tremendous job in being the focus for all festival set up. A feature of the festival is the youth that get the chance to preform in front of a receptive audience. This has is obvious by way of many Big Bands and the huge numbers who attend Merimbula. No doubt many Jazz musos were helped on their way in the jazz scene because of their stage exposure at the MJF. I’ve always had a love of ragtime music so a Ragtime Corner was introduced to the Festival a few years ago. It has proved popular with many great exponents of Rag performing on a Bolsius Grand. Ron Foale, the pater of the Gipps Jazz Band and father of Margie Fullerton, could hush a large Sunday night crowd in the RSL Auditorium with his solo performance on the Tin whistle. Then followed a tumultuous burst of applause for him that let out a special burst of emotion form the jazzers in that room. The provision of food and drinks to welcome the musicians to the festival has continued as a popular feature. Due to ever increasing numbers of bands and musos it has been necessary to program on Friday night due to lack of venues and not what the committee aimed for. This has grown from strength to almost perfection – no doubt one of the best Jazz Parades in Australia. All praise to Stan and Paul Ingle along with a great throng of musos with a great all in blow. Controls by regulatory authorities are ever increasing and bearing down on this public event. Despite computers the MJF program is still done by brain. The Committee has been to events where computer programming has been used. We think it is still kindest to jazzers, our way. Not to say that will be so forever. The 25th has reached to 7 venues – a record. Each jazz band is on stage for 2 slots of 45 minutes each. The Breakfast has had a chequered history but from a good idea of Stan’s it was moved to Saturday and has returned to be a pleasurable feature ever since. Notable in 2005, is it’s return to the RSL Club. The original Jazz picnic has changed from informal blows at Yellow Pinch Park to a programmed event at Sapphire Coast Turf club, where the facilities are great. This has been because of great general public support. All along the Committee has relied on Service clubs to do duty at the Festival. Firstly The Apex Club then Lions and Rotary and now the Robin Hood Club, provide great work and service for the Festival. In return they secure funding to return to charity according to their charter. 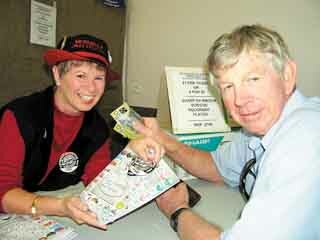 Commencing in 1984 the DSJC has been the source of happy jazz festival helpers over all those years. It is hard to imagine how the work of the festival could be done without them. Sadly some jazzers and some musos have passed on, while others come to keep the festival tradition going. Over the more recent years there have been changes in the jazz styles being performed. The traditionalists are there in great numbers, but along with them, is a group of musicians who experiment with the notes. It seems that there is an audience for all styles of jazz and the Committee is there to provide good venues, good audio, drums, base amps and pianos, along with a workable event program. Many thanks to those musos, original committee members and jazz lovers who helped me to compile this short record.